Does it matter whether the Earth is cooling or warming? Do the powers that be (The Worlds Elites) know the truth? I would say they do...I mean, they are paying the scientist & financing the educational & research institutions. OK, so they know. Would they keep it from the common man, & the women & children? 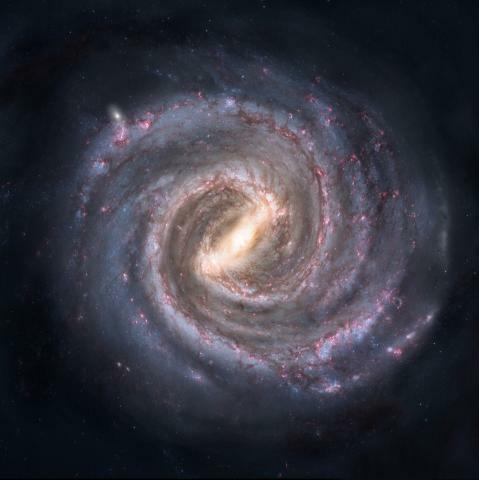 This is the Milky Way Galaxy, OUR HOME! We are about 2/3 out from the center of the bright light which some scientist say is a black hole sucking in Suns & Planets like ours. Our Sun & it' Planets (called a Solar System) cruise around this disk (Galaxy) in about a million years. BUT, as it cruises around, it does not cruise in a straight line, it oscillates like a plane doing touch & go's, (New pilot students practice taking off & landing, over & over at the same airport, not stopping for an hour or so). Imagine halfway from the ground to the highest point the pilot goes through a cloud, the pilot goes through it on the way up & back through it on the way down. Sometimes, in the cloud, there is turbulence, pelting rain, lack of visibility, etc. A little scary, yes? OK, Our SUN & it's planets does the same thing with the disk, we travel through the center to the bottom, and back up to the top, over & over. Kind of looks like a cloud, yes? Well, the Bible & other ancient writings talk about, three days of darkness, fire & brimstone (asteroids & comets? ), a pole shift (Turbulence). Some scientist & theorist say it's a six thousand year cycle, hence 6000 years ago we have Noah's Flood which is documented in histories all over the world, even South America. Then, again 12000 years ago, was the sinking of Atlantis. Some of the documentation discovered from the archeological sites have told tales of UFO's coming to the rescue and building huge underground facilities (recently discovered, check it on the internet). Makes me wonder about the UFO sightings now! Makes me wonder that if the Elites know this stuff, what are they doing to prepare? Check on the internet, you'll find evidence they are building huge underground cities. Funny thing, I did not get an invitation. Did you? An interesting video about our Galaxy! CLICK HERE TO VIEW YOUTUBE VIDEO! SOMETHING IS OUT THERE!!! Real Astronomer Evidence!!! How about a scientist point of view? A looming Ice Age? I was attending a CCI (Climate Change Institute) Meeting in Bangor, Maine & the speaker was talking about smoke from power plants & car exhaust. I had a recent copy of NEXUS Magazine with an article & charts showing Ice Age's for the past million years as they deduced from 1 mile core samples in the arctic ices. I mentioned it to the speaker & Guess what he did? Whispered to his companion and declared the meeting was over! HUH? I still have the Magazine. The same chart in my Magazine is in this video. Pause the video at about 3:48 min. & see where we are at! It is clear, something is about to change, if the present is to follow the past! Click Here ! TO SEE HOLLOW EARTH PAGE! First let me say this, I have no reason to promote or create fear! Actually, Fear is useless, if a Planet or Sun like body on it's way, there is very little we can do about it! I personally, want to know what's being said & hid by the elites who run this world. Do you? Some New Video's I found! Did the decision to go to war with Iraq have anything to do with these archeological digs ? Hurricane Sandy as Environmental War? Is the earth wobbling ?